In order to summon the Harvest King, the 5 magical bells have to be rung. The bells can only sound on sunny days between 6am and 6pm! 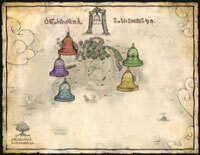 Each bell is protected by a Harvest Sprite, who needs you to do some sort of errand before the bell can chime. Your main task in the game is to collect the 5 missing bells and get them to ring in unison. Each bell and Harvest Sprite is based off of an element. As you restore the element powers you'll find functionality returning to Castanet. For example, restoring the power of fire will allow the Blacksmith to work on higher level tool upgrades. If you are lost in the game and aren't sure where to look next, press the 1-button on your Wii remote to bring up the help system. Fin will usually be there to give you a hint. If he's not much help, visit the Goddess at her pond and she'll give you a general idea where you can search to find the five missing Harvest Sprites.